USB 3.0, the third major revision to the Universal Serial Bus (USB) standard, has been renamed USB 3.1 Gen 1 by the USB Implementers Forum (USB-IF). However, there are no changes to the technical specifications. USB 3.1 Gen 1 (USB 3.0) offers the same ease of use and plug-and-play capabilities as previous generations of USB technologies, but with a 10X performance increase and better power management. For users of USB 3.1 (SuperSpeed USB), the goal of connecting devices to PCs or notebooks is the same as the USB 2.0 specification (Hi-Speed USB). 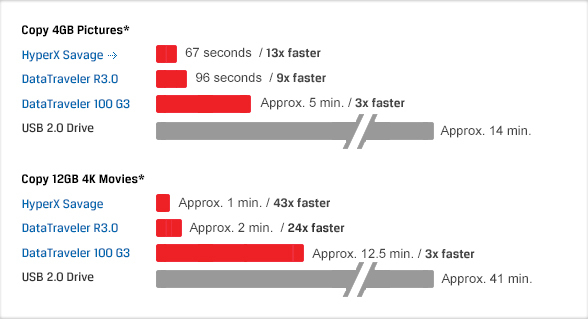 How fast is USB 3.1 Gen 1 (USB 3.0)? The performance increase is achieved through the USB 3.1 Gen 1 technology, which allows multiple streams of data transfer and boosts its peak signalling bandwidth to 5Gbp/s compared to 480Mbp/s on USB 2.0. Although the specifications are 5Gbps, transfer speeds vary based on the controller and NAND Flash configuration. Currently, USB 3.1 Gen 1 drives can be found with various architectures and channels. The higher the number of channels, the faster the transfer speeds will be. The new SuperSpeed USB 10 Gbps specification called USB 3.1 Gen 2 has been introduced by the USB-IF. This specification extends the data transfer rate to a theoretical speed of 10Gbps (or 1.2GB/s). USB 3.1 drives save you time by transferring files faster than USB 2.0 drives. The amount of time depends on the number of channels, the transfer speeds and the type of files that you transfer. What is the difference between USB 3.1 and Type-C? The simple difference is that one is a standard (USB 3.1) and the other is a connector (Type-C). There are a few standard USB connectors we see regularly today: Type-A, Mini-B and Micro-B. These connectors are found on everything from PCs to smartphones to GoPro® cameras. The standard that they use (USB 2.0, USB 3.1 etc.) tells us how fast these devices are capable of transferring files. Why do I need a USB 3.1 drive when I use only USB 2.0 ports? Due to the broad deployment of USB 2.0 devices in the market, USB 3.1 devices had to be backwards compatible. When you use USB 3.1 drives on your USB 2.0 host devices, there will still be performance benefits. USB 3.1 Gen 2 drives are backwards compatible with both USB 3.0/3.1 Gen 1 and USB 2.0 ports and connectors. Even when you use USB 3.1 drives on your USB 2.0 host devices, you’ll still save time. *Subject to change without notice. Based on internal data. Speeds will vary. Drives were formatted with NTFS.